Anyone that likes to discover new opportunities and expand the world in the palm of his hand, there is a simple and efficient way to do that just by using his smartphone. Keeping up with your community and finding all the best offered by your area of living can be easily done with the right platform on your phone. To make the search easier, we looked and we have for you an infotainment platform that will help engage with your community. Let’s see what the app is all about. What is HERE Boston all about? 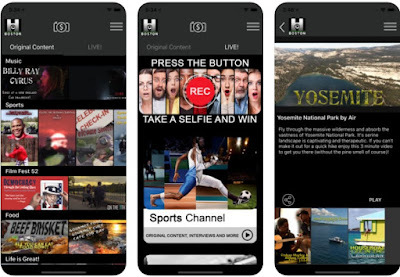 HERE Boston is an awesome entertainment app which is offering an infotainment platform for the users that want to keep up with their community and learn all the important information, engaging with all the best things offered in their area. Developed for iOS users, this OTT streaming content platform offers local and regional content for all major streaming devices. The best experiences in sport, comedy, food, music, adventure and more can be discovered with the platform and the users will be able to uncover new opportunities in their area and expand their world. The features on the HERE Boston platform will allow users to experience the absolute enjoyment of life in their place of living. The app has to offer innovative partners and emerging technologies which will allow users to enjoy the dynamic platform and its constant improvement and evolving. Users on the app even have a chance to win many of the daily cash prizes offered. Users will learn with this infotainment platform what is happening in their community and use the engagement features to simplify the sharing process for maximum visibility and attention. The things related with the user’s surroundings will be easily discovered on the app like the sections with the weather, food, sports, adventure, travel, live streams of special events, business and even a wide selection of independent films and documentaries available. Experience seekers and created can use the app to unite and get a chance to become partners, sharing with friends and constantly keeping up with their community. Download it for free on App Store now to experience complete enjoyment in your area of living!